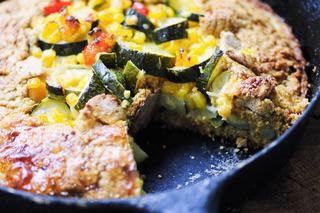 An easy and delicious gluten-free galette filled with a beautiful zucchini based calabacitas packed with corn, chiles, onion, garlic & cheese, and enveloped in a rustic chickpea flour and polenta crust. Our family is absolutely in love with calabacitas; and when I found myself making this beloved Mexican side dish one afternoon, I decided to mix it up a little and experiment with making it a more filling and hearty main dish . . .
. . . being that I absolutely adore galettes, I decided to get creative and make a savory calabacitas galette! I wanted to create a crust that naturally accommodated calabacitas flavors, and settled on a chickpea (garbanzo bean) flour and polenta (coarse cornmeal) rustic pie crust. And boy was I ever happy with it . . .
We gobbled it up in no time! It is the perfect vegetarian dish for using up your summer squash and zucchini, while also allowing them to shine center stage! And that crust? It is has just the right amount of sweet and salty crunchiness, and makes the perfect accompaniment to a deliciously healthy filling! I just know you will absolutely adore it, too . . . The Best Calabacitas: In a large pot over medium heat add your oil or butter, garlic, & onion and saute for 2-3 minutes. Stir in squash, corn, bell pepper, jalepeno and spices. Cover, and let cook for 15-20 minutes, or until all is fork tender. Turn heat to low and add cheese & milk. Stir until cheese is melted and all is evenly coated. Serve & enjoy!Calabacitas Galette: In a large mixing bowl combine polenta, all purpose & chickpea flours, sugar and salt. Stir until evenly mixed. Gently stir in your egg & cold water, and using your hands, knead until a uniform dough forms. Fold in sliced butter until evenly dispersed. Cover, and refrigerate for at least 3 hours. Preheat oven to 400°F. Place a pie dish or cast iron skillet into the oven to warm up while your prepare the galette. Remove your rustic pie dough from the fridge. On a floured or parchment paper lined surface, roll out your galette crust dough into a disc large enough to cover your pie dish/skillet with 1-2 inch overhang. Remove your preheated dish/skillet from the oven, and gently place your dough disc into it. Spoon your calabacitas into the center of the dough disc. Using your fingers, gently fold the edges around the calabacitas, overlapping slightly as you go. Do not try to make this part perfect - it is a rustic pie! So long as your overlap all the way around, it will be fine. Whisk egg and water together to form an egg wash and brush it around the crust edges. Sprinkle crust edges with coconut sugar. Bake for 30-40 minutes, or until the crust is golden and the filling is beginning to brown. Let cool for 10 minutes before slicing and serving. Enjoy!